The Barclaycard Lufthansa Miles & More® Premier World MasterCard® just launched a new sign-up bonus offer for 50,000 bonus miles. The offer looks to be good until June 30th, 2014. Normally the card only comes with a sign-up bonus of 20,000 miles, but now you can earn a total of 50,000 miles—you’ll get 20,000 miles after your first purchase and an additional 30,000 bonus miles when you spend $5,000 on the card within the first 90 days. Get 50,000 Lufthansa miles – 2 flights within the US or 1 flight to Europe! It’s nice to see the 50,000 miles bonus offered again on this card, and it’s as high as the sign-up bonus has ever been on this card. Barclays usually increases the bonus on this card for a limited time, so if you’ve been thinking about grabbing this card with the higher bonus, now is the time to apply. The $79 annual fee is not waived in the first year, but you’ll get at least 2 free domestic economy flights from the 50,000 so paying the fee seems worth it. You can also get a much better access to premium awards on Lufthansa and SWISS. 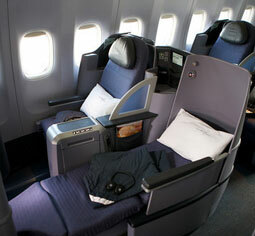 Miles and More is the loyalty program for Lufthansa, which is a German airline and a member of Star Alliance. This means that you can redeem Lufthansa miles on any Star Alliance airlines, including United, Turkish Airlines, and many other partners. Having Lufthansa miles also gets you better access to award availability on Miles and More partner airlines that include SWISS and Austrian Airlines. Finding award seats on these airlines is notoriously limited using other Star Alliance airlines miles, and after the United devaluation the cost of awards on these airlines increased dramatically. With Lufthansa miles you have access to much more award seats, since Miles & More reserves award space for its own members. This makes having Lufthansa miles very valuable for awards to Europe. With the current Miles & More Premier World MasterCard 50,000 mile bonus offer you’ll earn 20,000 miles after the first purchase and 30,000 miles after spending $5,000 within 3 months. As a Barclays card, the $5,000 minimum spending requirement is higher than usual. For instance, the Barclaycard Arrival Plus™ World Elite MasterCard® has a $3,000 spending requirement for its 40,000 (worth ~$440 in free travel) mile sign-up bonus and the Frontier Airlines credit card only has a $500 minimum spend for 40,000 bonus miles. With that said the 50,000 Lufthansa miles can be worth a lot more (~1,200+) when redeemed for award flights. When it comes to using Lufthansa miles there a few essential things to cover. The first is that their award chart is zone based. Secondly, Miles & More passes on fuel surcharges for many of the awards, so be aware of which airlines you can book on to avoid paying these. Lastly, Miles & More has some of the most generous stopover and open-jaw rules among any airline miles, and means you can potentially get creative and add a lot of value to your awards. Lufthansa miles have some great uses, and some not so great. One thing to watch out for are fuel surcharges, which you won’t pay on awards with United (except awards to Europe and Asia), Polish LOT (Polish airline), TAM (South American airline), TACA, Air New Zealand, and Avianca. Lufthansa is a Star Alliance member airline which means you can use your miles on any of the 26 partner airlines, including United (US Airways just left). Between these airlines you can fly almost anywhere in the world, with that said there are some sweet spots on Lufthansa’s award chart. You can also use Lufthansa miles to book one-way awards at half the round trip price. Plus, Miles & More’s generous stopover rules allow you to book stopovers on one-ways, making it possible for creative and flexible award routings. After you create a Miles & More account you can book awards online on Lufthansa, Austrian Air and Swiss Air, but to book awards on other partner airlines you’ll have to call the reservation line. By enrolling in the Miles & More newsletters when you’re registering a new account you will get 500 bonus miles. Lufthansa’s award chart has some sweet spots that make using these miles even more valuable. In short, the 50k Lufthansa miles are worth 2 round trip economy flights within the continental US, 3 First Class one-way flights on United within the continental US, a one-way Business Class flight to Europe from Dallas for 55,000 miles, or a round trip economy flight to Europe from the US for 50,000 miles. You’ll also get access to much better First and Business Class award space on Lufthansa, Austrian ansd SWISS, but it costs a lot! You can fly entirely within one country (continental US) for 25,000 miles round trip in economy. You won’t pay any fuel surcharges when you fly on United within the Continental US or Canada. If you want to fly to Hawaii it only costs 40,000 miles round trip in economy, which is also a great use of the miles and 5,000 miles cheaper than using United miles. It’s only 17,000 miles and only $2.50 in taxes (no fuel surcharges) to book a First Class one-way flight within the US on United. This includes flights from the mainland US to Alaska, but excludes Hawaii and the Virgin Islands. This means you can get a First Class one-way flight on United’s flat bed premium service flights between LAX/SFO and JFK. This is 7,000 miles cheaper than using United miles. You get booked on United First Class when you book a Business Class level award for 35,000 Lufthansa miles, which makes using Lufthansa miles for flights within the US a valuable proposition. A round trip economy class ticket originating in the US to Europe is only 50,000 miles. This is 10,000 miles cheaper than most other US-based carriers, including American Airlines and United. You can fly on Lufthansa, SWISS or Austrian, but you’ll pay more in fees than booking on Polish LOT (no fuel surcharges!). Remember, you can book one-way awards with Miles & More and you get a stopover in each direction. This means when you book using one-way awards you can visit 3 European destinations on one round trip for 50,000 miles. Plus you can add an open-jaw. You can book a round trip economy ticket to South America for 60,000 miles. When you book flights on TAM, TACA, and Avianca you won’t pay fuel surcharges. You also have the flexibility of adding stopovers in each direction, but you cannot stopover in another region. Lufthansa Miles & More is a transfer partner of Starwood Preferred Guest. You can transfer any Starwood hotel points you earn from the Amex SPG personal and Amex SPG business credit cards to Lufthansa. If you need to top off your account remember you’ll want to transfer in increments of 20,000 points so you get the 5,000 extra bonus miles. No foreign transaction fees means that you can use the card on all your trips and not pay any fees when making purchases in foreign currencies. The $79 annual fee is not waived for the first year. For two economy flights within the US it seems like the annual fee is worth it, and you can get even more value from the miles if you use them for international flights without fuel surcharges. Earning the 50,000 bonus miles from the Miles & More Premier World MasterCard after spending $5,000 in the first 3 months will be enough miles for two roundtrip economy or 1.5 round trip First Class flights within the US. Since taxes and fees can be high on international Miles & More’s award travel, you will get the most value out of 55,000 miles for domestic awards using United, flights to Europe on Polish LOT, or flights to South America on TAM, TACA, or Avianca. You can use Lufthansa miles to book one-way awards on any of the 26 Star Alliance partner airlines, allowing you to book a one-way awards with stopovers. This gets you up to two stopovers and two open-jaws per round trip. Next year I plan to begin my South America travels in Argentina, so I’m planning on getting this card to use part of the 50,000 miles to get me down there with an open-jaw for my return from a different country. If you apply and are not instantly approved you can call into the Barclays reconsideration line at (888) 232-0780) and dial 3 for application status or check your application status online. Overall this is a great 50k offer and Lufthansa miles offer huge value for award travel to Hawaii, domestic First and Business Class, Europe, Asia, South America, Central America, and Australia. The award chart for Lufthansa is now very competitive, and after the devaluation may be more favorable than United’s for long Business or First Class awards. You can get a roundtrip economy award ticket from the U.S. to Europe for 50,000 points, 105,000 in business, and 170,000 in first class. just curious if this card and Barclays in general has retention offers. would prolly like to keep the card after the 1st yr just to keep the miles from expiring (if I dont use em up for an award redemp)… speaking of which, when do miles expire anyways? after 3 yrs like most other major airline FFPs? do you have any info if anyone was able to churn on this card ? Choi, the T&C say “This offer is available to new Cardmembers only,” but I’ve heard reports of people getting more than one card, and if I remember correctly it was at the same time.